Step 1: Find the tooth and gently pick it up by the crown. Do not touch the root where tissue may still be attached. Step 2: Carefully rinse it with water, but do not use any soaps or cleaners and do not scrub it. Do not dry it because it needs to be kept moist. Step 3: If you can, gently try to place it back into the socket and bite down on a piece of gauze to prevent it from moving. If you cannot reinsert it, the tooth will need to be kept moist. It is best to stick it in a closed container of saline solution; however, if you do not have any on hand, place it in a cup of milk instead. Step 4: Call your emergency dentist right away. Time is of the utmost importance to save your tooth. Although you cannot fully prevent a tooth from being knocked out, there is something you can do to try to reduce the likeliness that it will happen to you. The best thing you can do is to use an athletic mouthguard if you play sports. It is estimated that 200,000 oral injuries each year are prevented in the United States due to the use of a mouthguard. It is a custom-made oral appliance that adds a layer of protection to your teeth. While you can purchase them over-the-counter, it is best to get one from your dentist. They will offer the ideal fit for the maximum level of protection while being made of the highest-quality material. If you find yourself in an emergency where a tooth has been knocked out, do not panic. Contact your emergency dentist right away to have it quickly treated to restore your beautiful smile. Since 1977, Dr. James D. Geer has provided exceptional dental care to the community to create healthy smiles that last for a lifetime. He believes in always being there for his patients with complete dental services, even during times of an emergency. 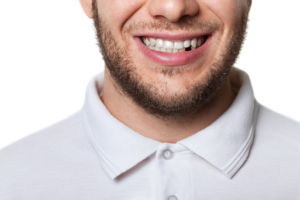 If you have a missing tooth, contact our office today for an appointment.